Hi all, thought I would Start a thread to share your progress and screenshots. For anyone who needs help embedding images, you will need it to be hosted somewhere. The easiest thing to use is probably Imgur, sign up for free and then upload your images. Once your image is on there you can just copy and paste it directly into your post here on itch. You can also use the HTML editor and enclose the URL in the IMG tags if you're comfortable with that. 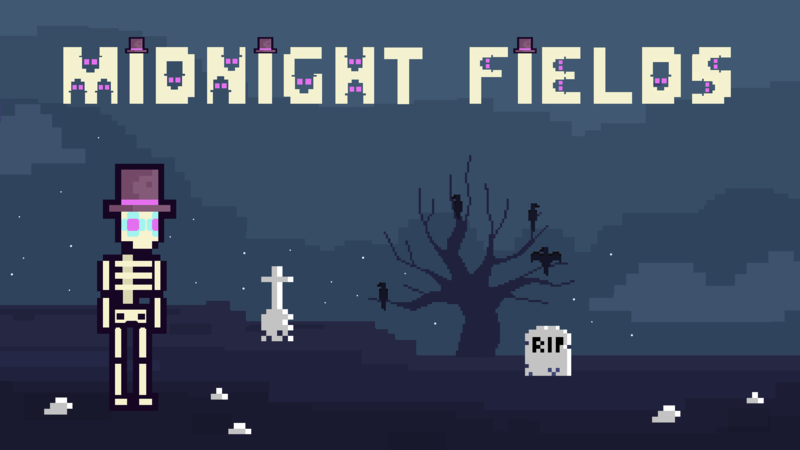 I'll kick us off, here is the first mock-up of our game, called Midnight Fields. 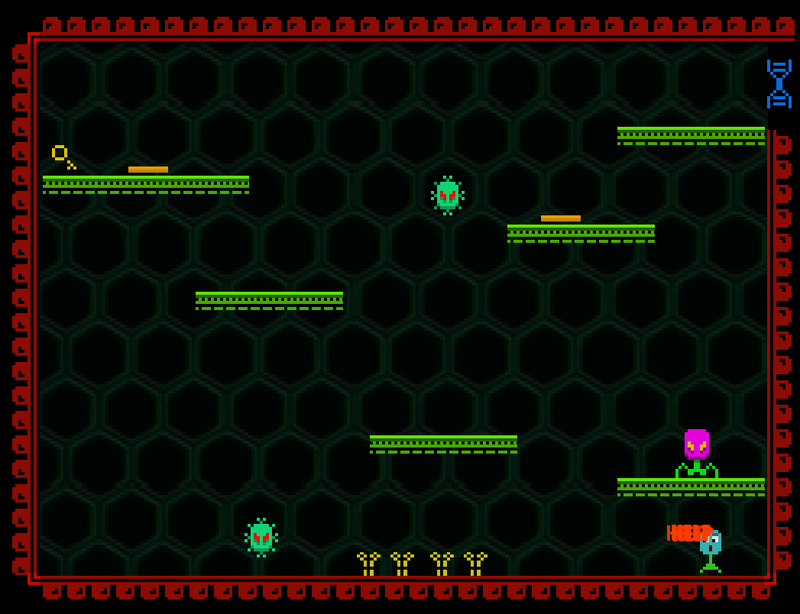 It's going to be an arcadey top-down shooter set in a sort of weird underworld. Idea is mostly there but will probably be tweaked a lot over the next few weeks. Top-down + a dinosaur reminds me a little of Jurassic Park on the NES :) God, I'm old! My intention is to finish Sam & Sara, a simple 2D platforming game I've been working on, off and on, the last couple of months. The idea was to build something, start to finish, in 38 hours of actual work. My reason for this is to test out a time schedule I wish to implement during game jams. I asked what to make on Twitter and got challenged to 'make a game about challenging yourself'. I translated this to a game in which a man named Sam or a woman named Sara constantly races towards their goals but get hindered by their own past. Game play wise this means that every time you reach a goal, a ghost of the past appears that performs the exact same actions as you have done before. Hitting a ghost equals losing the game. A high score system keeps track of how many goals you could reach before getting hit by your past. I am now 29 hours into development, meaning I still have 9 hours left to go. My goal is to use these 9 hours to tidy up loose ends and polish what I've got so far. Beneath are some screenshots of the progress up until this point. Good luck to you all, and for god sake, FINALLY FINISH SOMETHING! This is great! And you work so fast! Will the player be allowed to place the pickup in the final version? No, I played around with that idea at the beginning of the process and it stuck around for quite some time but in the end I decided to switch to a randomly placed goal (from a predetermined set). Having to set the goals really messed with the flow of the game. Players became confused by this sometimes. It gives me more agency over the level design. I can force players to pass through certain difficult paths. 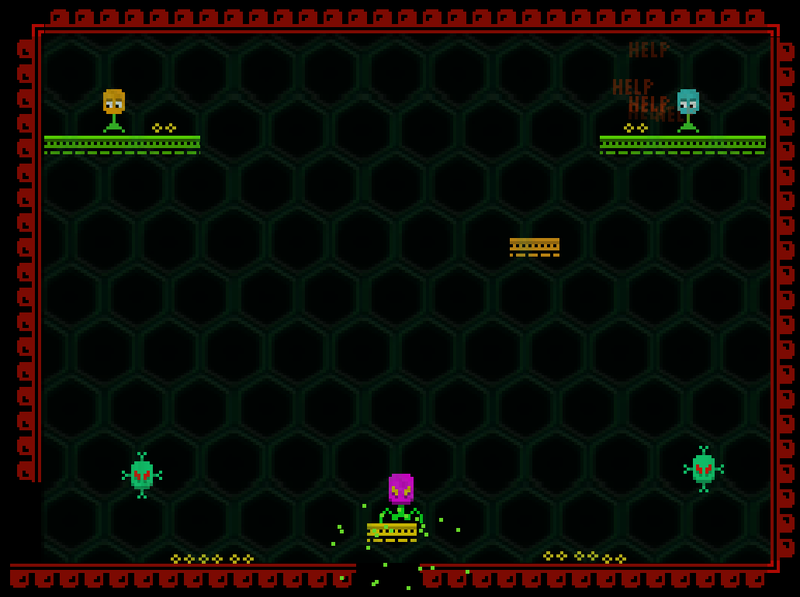 It adds a level of randomness that allows for weaker players to beat a high score every now and again. This doesn't happen often but when it does it's real cool for them. Although it fitted the theme of 'challenging yourself' very well, all these reasons ended up being more important to me than sticking to my initial idea. Thanks for the thorough reply! I'm using the same or similar method for pickups in my game (using the predetermined set) without thinking too much about it (I'm focusing in other aspects of the game), but that design choice piqued my interest. Maybe it could work in a game with a different goal. Anyway, I love to think about metaphors for mechanics, so it's food for thought. 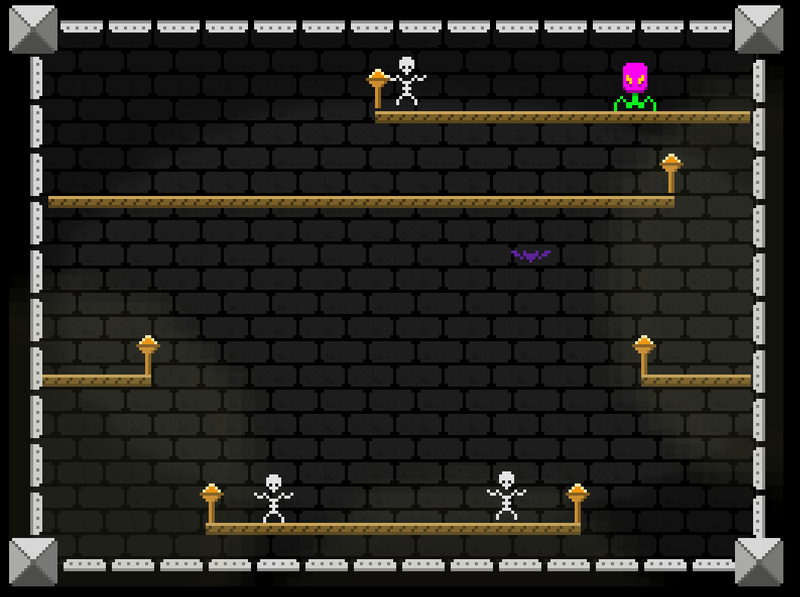 I think it might work well in a setting where the player gets rewarded for placing a goal further away, while also increasing the risks involved to get there (like perma death and harder enemies along your path). This way you encourage the player to really challenge themselves while also being realistic about their own skills. This would also facilitate longer play session in between goals taking away the problem of flow loss in between 'rounds' as a breather from time to time would be a good thing I guess. It still leaves the problem of level design, but there's certainly a solution for that once you know the setting of the game. If I ever come across such a design, I hope I'll remember this thread. I'm using Java personally, with Eclipse. I'm working in Unity with C#. Unity has a lot of 2D tools in recent years that make working with sprites, 2D physics, etc... way easier. 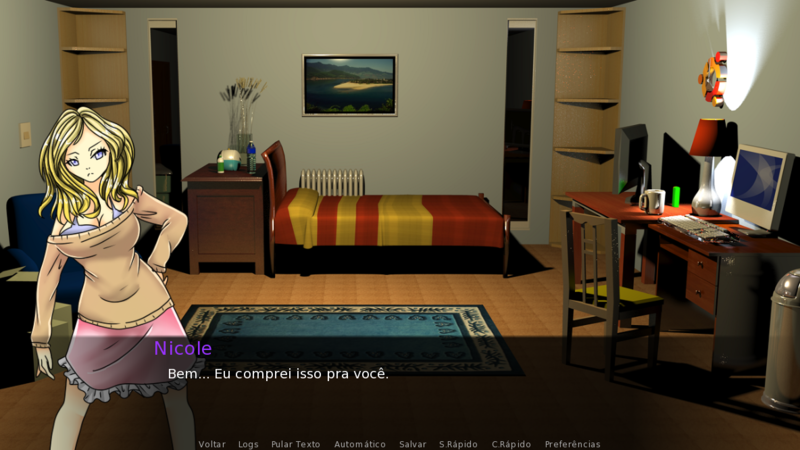 The platform character controller is something I made myself though and migrates from project to project. This way it gets updates on a regular basis. 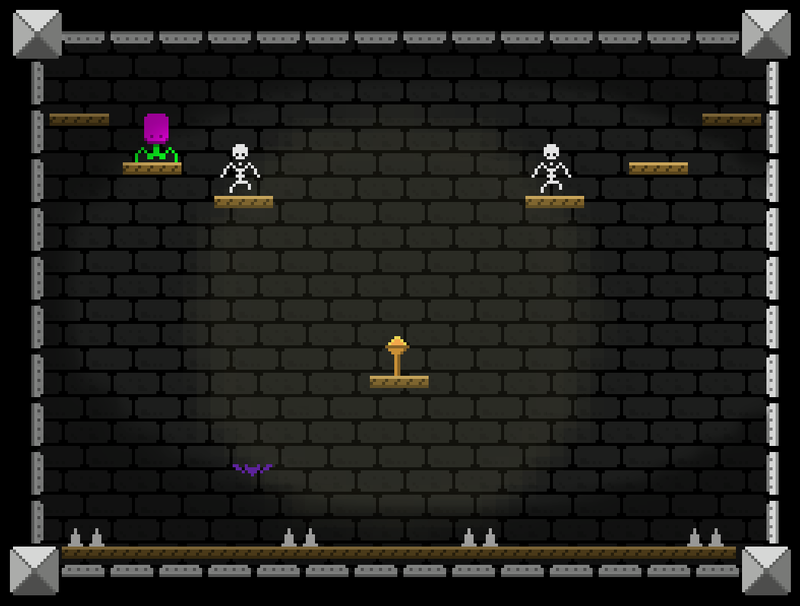 This time dash and double jumps were added for example. Cool! Nice Seinfeld joke there! That also seems to indicate that the characters are adults, am I right? No way, it looks great for a first one! Haven't played much of the genre, that's why I was curious about the ages. Anyway, good luck! Another 1h30 gone, only 6h30 left! Added variable jump height so players have more agency over their jumps. Sam is able to dash now too, but that doesn't feel quite right yet. Atm it works just the other way around actually. Sam can't be hit while dashing, but when ghosts dash they are very dangerous! This makes dashing a tool in one case but forces you to use it carefully as the movement of the ghosts also becomes more unpredictable. I'm not sure yet if the invulnerability will stay though. Might make Sam the 'right' choice over Sara, and I want them to be both viable. We were itching to do a new project in a short timescale, so we're joining in as well. This time there's two of us, programmer and artist. 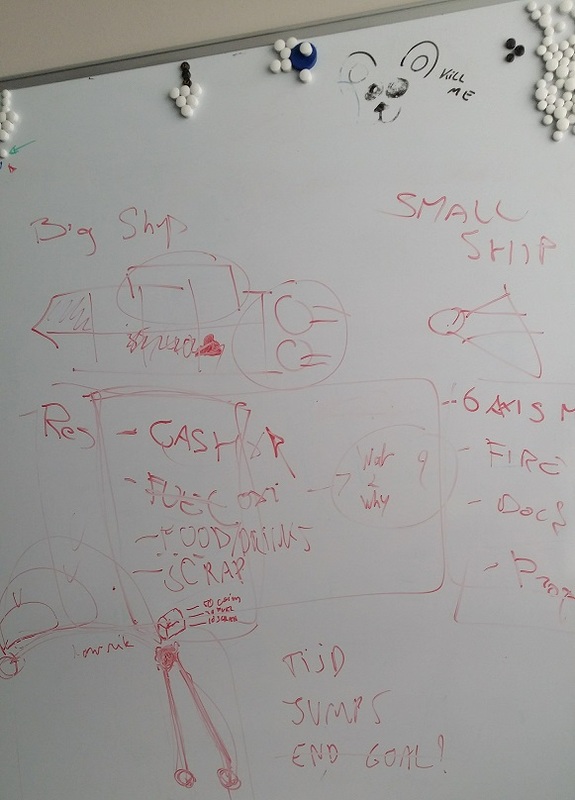 Our core idea revolves around a lone space fighter defending a big mothership. We want to try and focus on the balance between maintaining your mothership's integrity, and fighting off hostiles. I can't share much further details, since we're not sure about them yet either. Seems like a great start. creativity rocking along! Good job everyone, some cool stuff in the works. I've got nothing much to share tonight, spent all evening doing boring things like menus, pause, high score table, control selection etc. I think I've got all the framework stuff up and running now, so I can start to do something more fun over the next few days. The other 2 team members are trying out some character designs so will share some of that soon. Looking forward to seeing the character designs! Good job on the systems. I always put them of to the very end. Sometimes this results in games without a shutdown function. Alt+f4 or keep playing! Hey Everyone, hope your game is going well, just posting on the threads to see if anyone has had much experience submitting .jar (java awt) games to itch.io? Anyone out there like that, all I really need is to set the "entry point of my game' correctly I believe,... to get it to play in a browser. My main issue is having the game as a playable .jar in a browser, thanks! Its going to be made up of a series of rooms where you have to kill all enemies, simple as that. 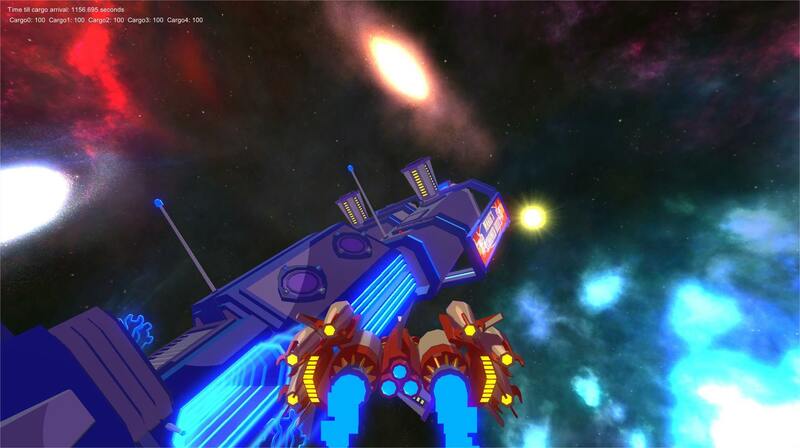 Target shot> once fired at an enemy your fire is homed at hit enemy, can be seen as green sphere in img. Without it you fire straight ahead. Jumping> You can jump straight up to avoid enemy fire, strafejump, and a longer strafejump. Scoring> After each room you will get a score based on you damage, hitcount and combo count. LVL 2. gif ruins the jump its alot smoother in game. But here you can see the combo increasing after i kill the second enemy. 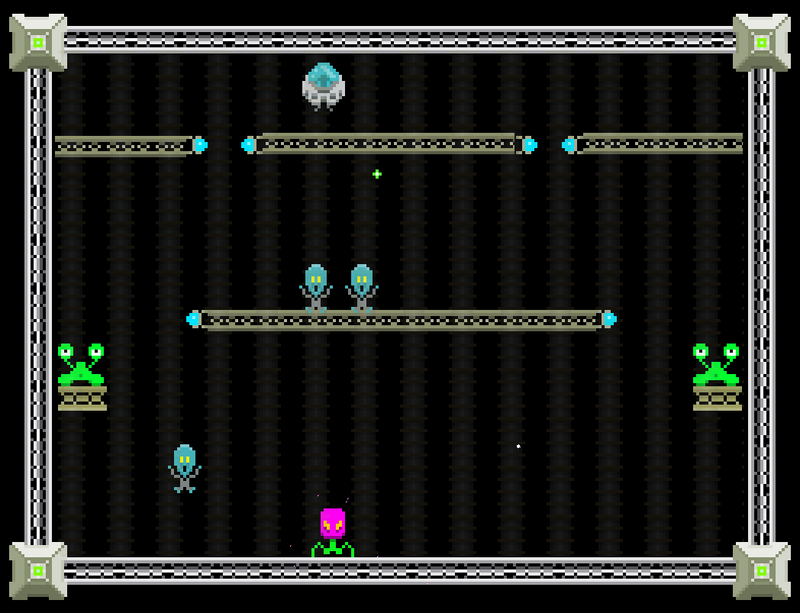 Planet Lander: Killer Rocks from Outer Space! 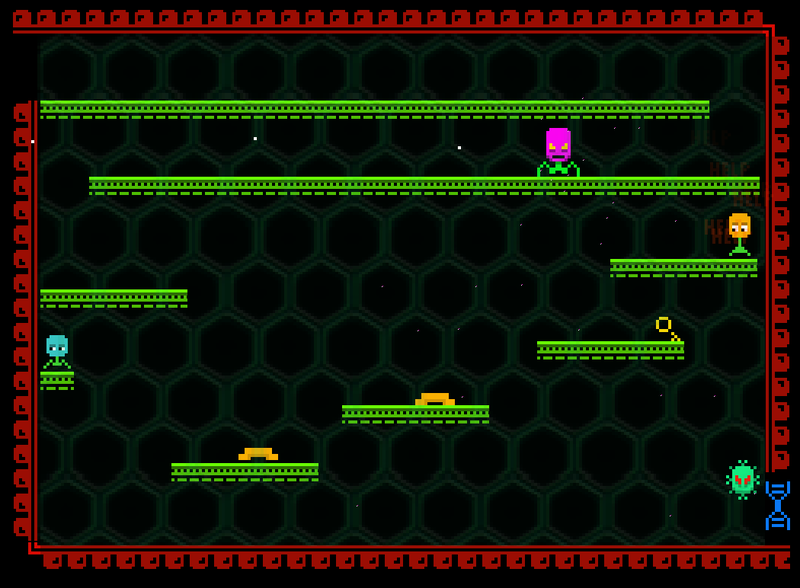 The objective of the game will be to survive as long as possible while getting a High Score. By destroying the Asteroids you will gain minerals, and by landing safely back to your planet with those minerals, you will give the population extra materials to build you extra ships (That, of course, represent "lives"). So there will be (Hopefully) a mechanic of destroying the spacial rocks, retrieving the precious metals that they leave behind, and taking them back to your planet whenever you can. 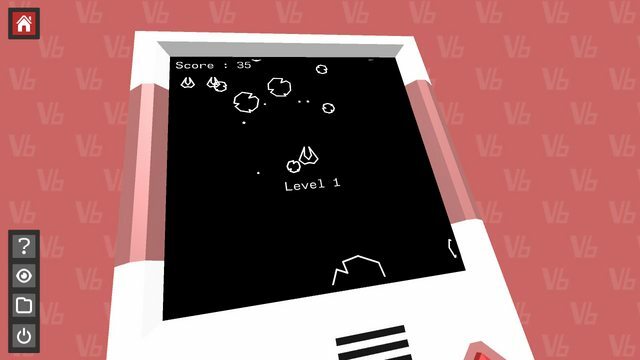 Defend your planet from spacial rocks and killer aliens! Last all you can before your inevitable demise! How long can you survive before you are overwhelmed by asteroids and you and all the population of your planet dies!? Find out by playing Planet Lander! Another two hours closer to my deadline. Only 4,5 hours left to go, this is getting tense! I re-did the UI tonight. It didn't scale all to well before and people rarely noticed the message system or even the score before. Should be better now. 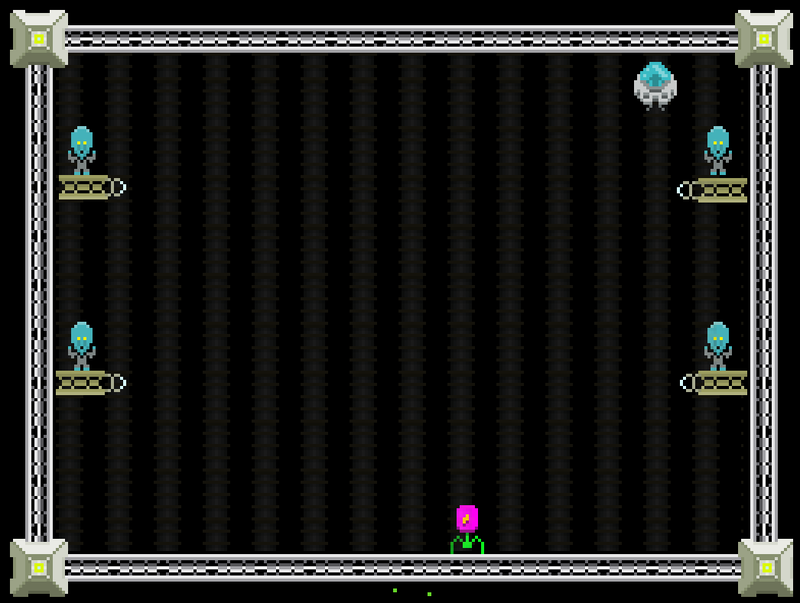 Also added sound and a little dash frame to the new dash feature. I've changed the goal image to be a polaroid, presenting a memento from the past. Not sure if that's very clear. Any ideas? So much little stuff left to do! I guess I'll have to start choosing my battles real soon. Have a good gamedev day everyone! So is the game a philosophical piece, about how spending too much time focusing on the past will impact on the present? Like chasing memories will only lead you into trouble? That's very deep, I like it. Also, something I wondered about the past version of yourself - if you stand still after you've collected the polaroid, would the ghost jump into you and kill you? For the second question : most of the times it will not kill you. Sam and Sara have some momentum so when you grab the polaroid and stop giving input you will go on for a tiny bit. Most of the time that's enough to stop the ghost from colliding with you. 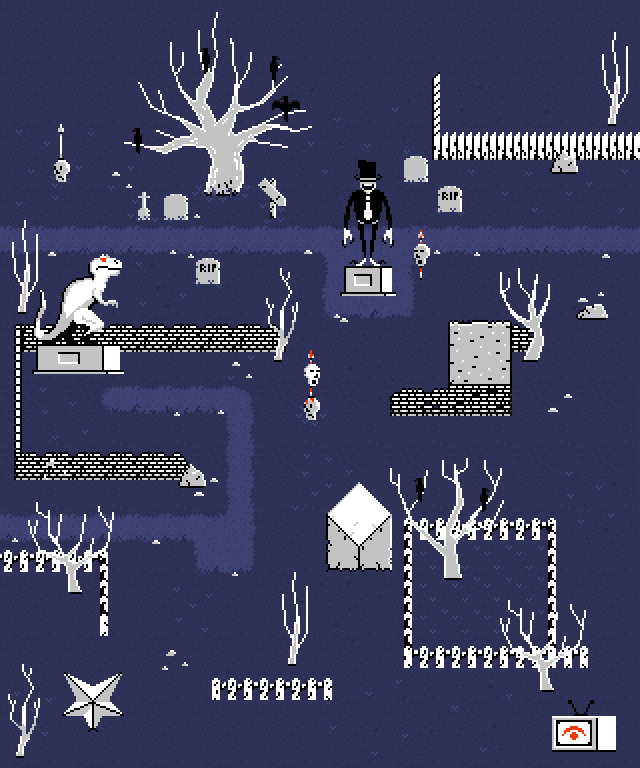 The ghosts also have a tiny 'free zone' where they visuallt collide with the player but won't kill you. This let's the player have 'close to death' encounters that lead to exciting moments. This also helps with the issue. I really really like what's going on here. I love this! Please, include the dancing. 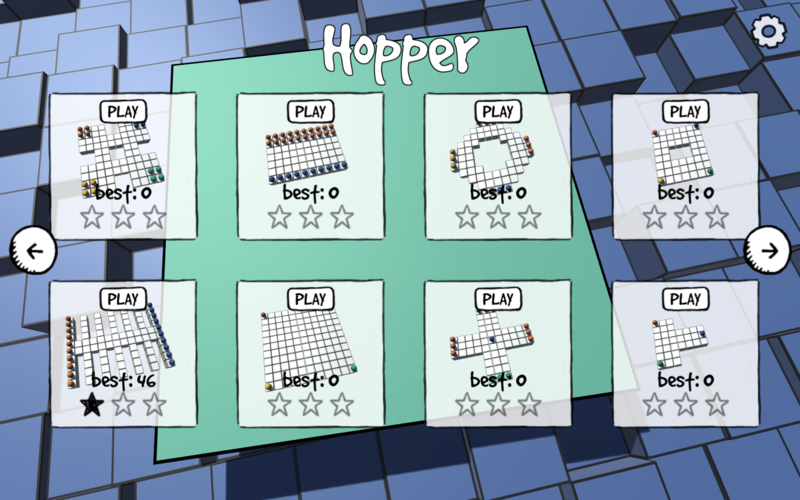 Just finished most of the UI, now for more levels and smarter AI! Perhaps a more cool background as well? Oh wow me too, you know what you have to do! This game honestly looks really fun. Kenny, the awesome guy doing anything and everything visual, got us covered! We've got featured on HardcoreGamer's Screenshot Saturday lineup! And it's getting better by the minute! looks really awesome, looking forward to trying it out! Keep up the amazing work! hit reaction on player when getting hit. And added health to the player so you can die. Been working on finishing up the launcher page's productivity tools. While they're not core bits of the program, they're really giving the front page a purpose and are actually turning out more useful than I expected, thanks to a couple last-minute additions. Github integration is getting harder though. Below is progress on the Contacts page (a built-in address book that automatically adds contact info for people participating in your projects), plus a show of the About button actually pulling live information. Still need to connect the sorting features, update the profile headers, and handle the notes sections (which are beasts of their own, since I'd like to give the notes a (simple) HTML editor for formatted text). After that: connecting to the schedule page & starting on the first tools (probably the Form Creator, since that'll be the basis behind the file structure I need for those buttons on the Home page). Almost onto the fun stuff. Side note: Thanks, Gif. I could've found that broken code when I wasn't taking a break. //time to go make stuff load properly hahaugh. Whoops, forgot that this discussion was in a different thread, so I didn't explain much. Just to tl;dr, it's a program that keeps track of your creative projects' progress and details, generating certain assets while you outline and design. 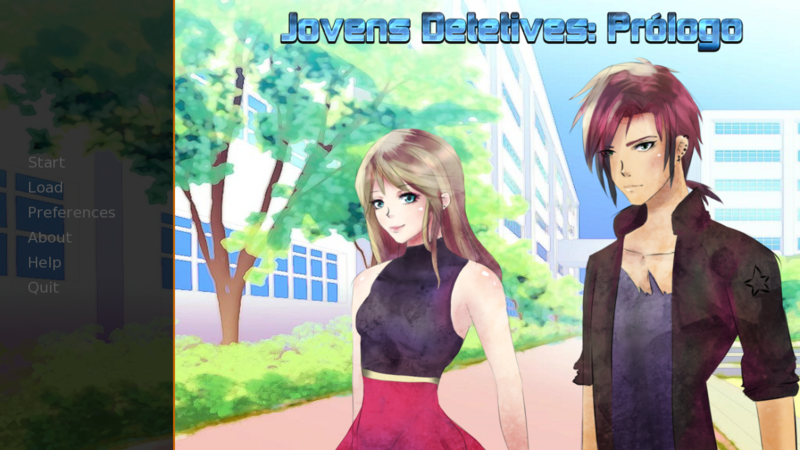 It also supports collaborative universes for sustainable fiction development, i.e. where a whole new world isn't built for every project. 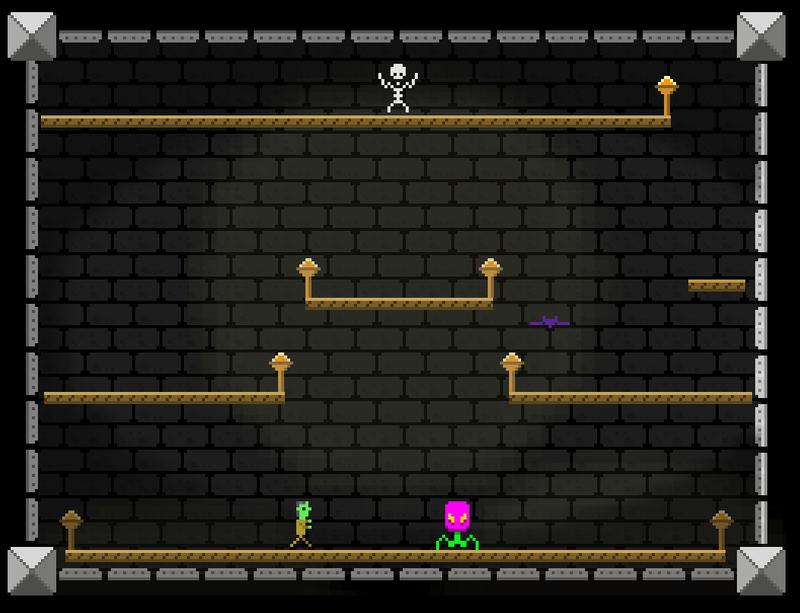 I'll only be getting the bare bones done for this jam, though. It's something I'll be adding features to as they're needed. This is a quick snapshot I did of my game Red vs. Blue. 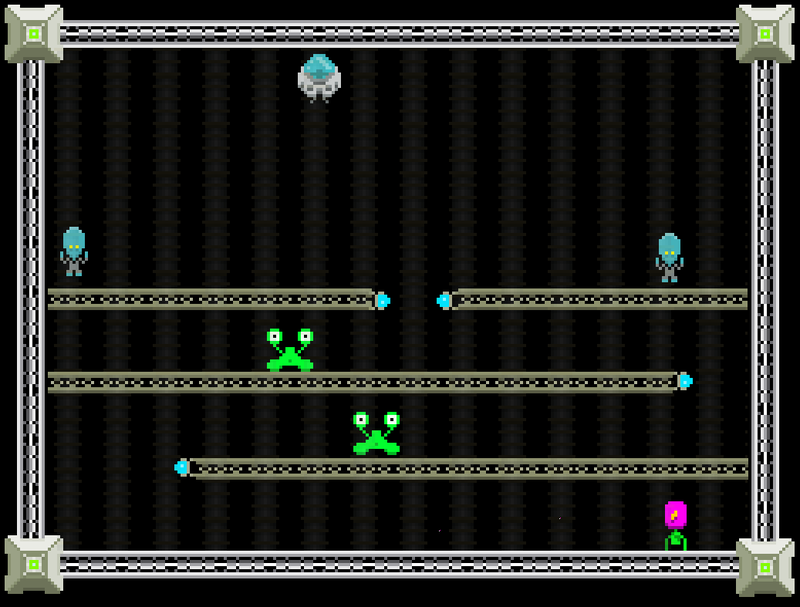 There isn't much yet but it is in a playable state as it is. Proud to say I will be joining the Mientje team as a game designer and gameplay programmer on their already awesome project! I hope this is ok with the rules as I already finished and submitted Sam and Sara. Finally Finish Two (?) Things! Finishing 2 things is.... OK! 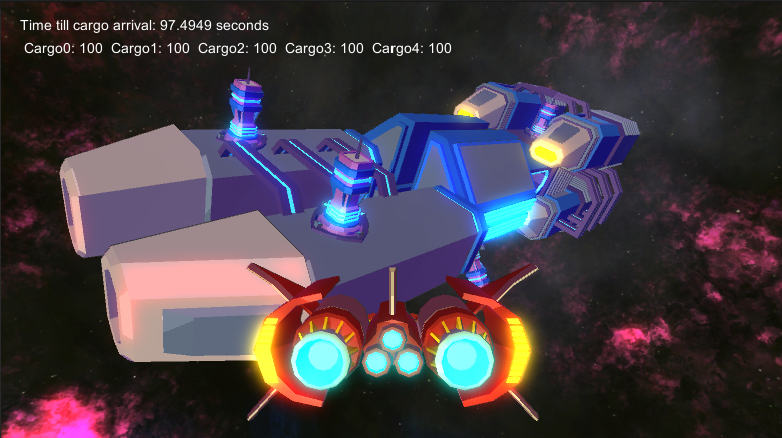 During the last few days I've been implementing more complex collisions, cooler explosions, and the ability to shoot highly destructive lasers. All sorting stuff for the contacts page is now done. Just need to set up the groups / teams pages & add edit/delete features before I'm finished with that part. (I've decided to skip the Schedule & Published pages for now, so the related sections will be blank temporarily.) Will probably be testing out some stuff on the Tools page next to get an idea of what file structure the core program needs. Trello. I made a promise on Twitter, that if Sam and Sara was downloaded more than 38 times (or 1 time for every hour I worked on it) I would create more levels. That number has been reached so I started work on 5 new levels. Here are the first two. A brilliant and inspirational game jam this, really got my arse into gear so time to share some screens from the entry I'm working on, and it's also fantastic to see so many quality entries in the pipeline. Looks great. I love the background lighting in the first setting. Thankyou, I might try to get a similar lighting vibe with the other areas too. This reminds me of 'Hugo's house of horrors', and that's a good thing! He's all like : "Where do you need this fire?" 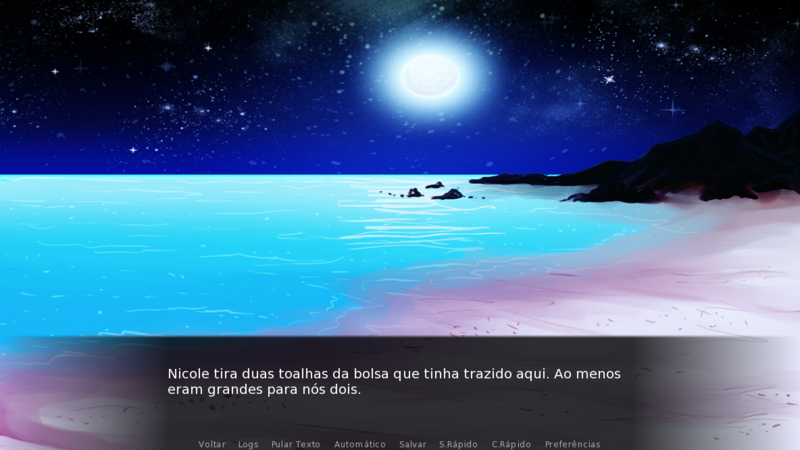 I love pixel art and that is just beautiful! Keep it up! Another Update! Now landing is possible! Next, I am working on the sound! I have the self-imposed objective to make the game take the less amount of disk space possible (Ideally, less than 1.44 mega bytes, the size of a floppy disk), so I wont be using pre-recorded sound effects at all. Instead, I am working on some algorithms that procedurally generate the different sounds. Hi there! It's late and I want to go to sleep, but I wanted to ask you a question first. Which graphic style do you prefer as the default? Sorry for the lack of sound, I haven't been able to configure my capture software properly. Anyway, you will be able to change between them by pressing a key. I am starting to like more the "Lined" style. As you were the only one who answered my question: Congratulations! You voted for the winning category! 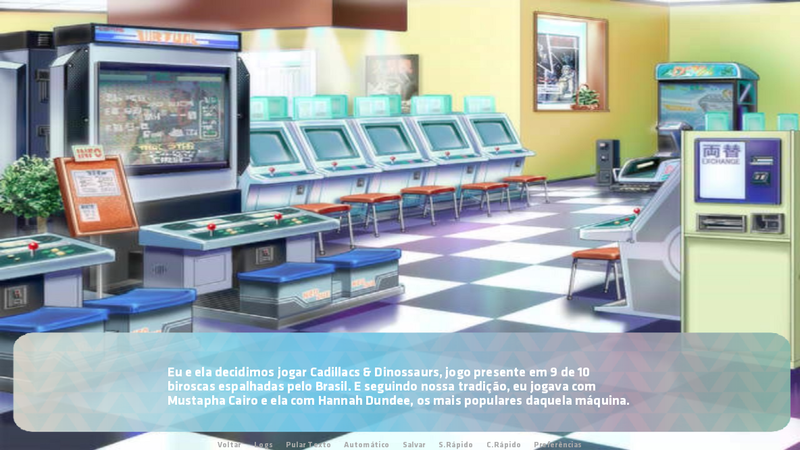 Thanks to you, the game will have the filled style as the default. But really, thank you for a lot your opinion! 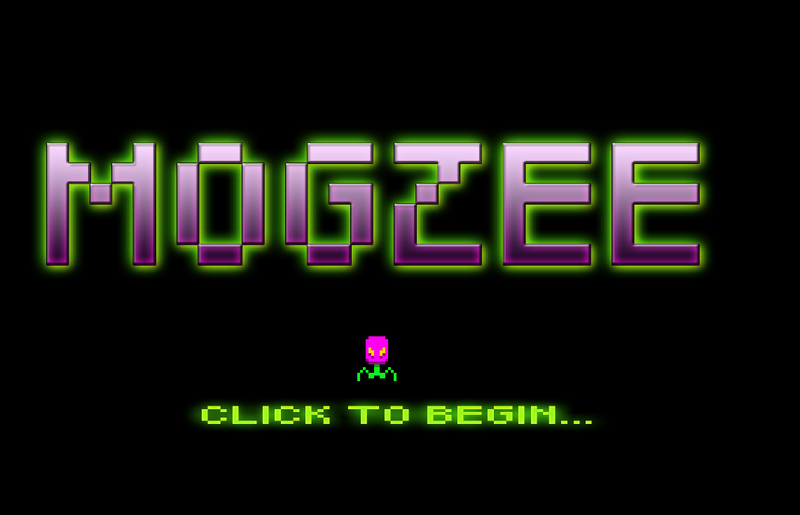 We've got a title screen! A year ago my husband and I decided to make a turn-based strategy game. We both like this genre. He came up with the idea of computerizing a board game that he has invented a few years ago. I already had some experience in game programming with Unity, so I started off with a map editor. Then came the game itself. Much time was spent on AI behaviour (expected) and user interface (surprisingly). And now the first release version is finally published! I tried to finish it till the end of January to participate in this jam. Sounds like a cool idea, welcome to the jam! I've just published my entry to the jam. It's called 'Give Me My Houmous! ', and it's an endless runner. You're a dinosaur who just wants to have a picnic, but your houmous has been stolen. It's the first game I've managed to finish, so please check it out and feel free to give me feedback if you have time! Here is a look at our game Shadow Fencer Theatre. We did a post on it in another thread if you want to see the changes we made to complete something for this jam. Hope to get it submitted tomorrow, but my guess it will be Tuesday. I didn't know whether I would be able to submit my game at the end, which made it a little harder, but the jam still motivated me to finish writing the alpha of my 20K word text game. I wrote the last passage this afternoon and I keep having to remind myself that it's a huge milestone, even if the results aren't very tangibly impressive. I've added some chip-funk-music to my Sir Runalot game. I just published my entry! So close to the deadline! Maybe tomorrow, after resting a little, I will write about my fantastic experience on this jam. This was my first time participating in one, and it was a really cool experience. Thanks to Second Dimension Games for this opportunity to start the year in a way I haven't done in so much time: Finishing a new game. No problem, congratulations on your first jam game! Ahaha, rest in peace, just about to submit, then noticed I was a minute off already, since it was :59; oh well. Looking forward to trying all the other games submitted!